Shag carpets give any home a warm, comfortable feeling. These rugs can add a nice touch to any room and are lovely to walk on and sometimes even nap on. However, cleaning your shag carpet can be a nightmare if you don’t have the right vacuum cleaner. You want your shag carpet to stay beautiful for a long time and keeping them clean is essential. This guide will help you find the right vacuum for your home and your shag carpet. I’ve included a buyer’s guide, with some helpful tips on how to find the right vacuum. Next up, you’ll see reviews of my five favorite vacuums for shag carpets. Last you’ll find some Frequently Asked Questions about vacuums that will help you as you shop. Keep reading to find a vacuum cleaner that will effectively clean your shag rugs and carpets. 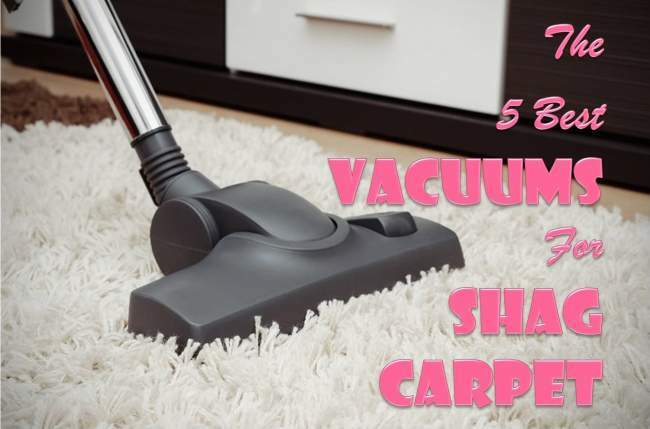 First off, I’ve written up some tips to help you select a vacuum for your shag carpet. Shopping for a vacuum can be intimidating even if you don’t have shag carpets. There are hundreds of brands and models out there, all promising to keep your home clean. Hopefully, this guide will make the process easier and help you narrow down the right vacuum model for you and your home. Here are some elements you are going to want to look out for in your vacuum cleaner. If you are cleaning a shag carpet, you want to make sure your vacuum has adjustable suction power. This feature will ensure that your vacuum can clean both your shag carpets and your regular carpet and hard floors. A machine with concentrated sealed suction is ideal for cleaning shag carpets, as it provides exactly the right power to get your floors clean. When you buy a vacuum with adjustable height, it ensures the machine is comfortable for you to use. You want to make sure your vacuum is the right height for you. The adjustable height will also help you accommodate your vacuum for your specific floors. There are even models that come with automatic height adjustment for your convenience. Most vacuums include attachments that can enhance the vacuum’s effectiveness. A shag rug rake is a very useful addition to your vacuum. This tool gets deep into the long fibers of your carpet or rug and makes sure it gets even the hardest-to-reach dirt. If your vacuum does not include the rake, consider purchasing one in addition to your machine. One thing you do not want is a vacuum that is too heavy for you. Make sure your vacuum is the right weight. If it isn’t, you may find it difficult to maneuver around your home. This will decrease the frequency with which you vacuum and may even result in a messier home. Be sure to check the weight of your vacuum and consider testing it out before you purchase. Storage potential is an often-overlooked element of your vacuum. Even if your vacuum is perfect for cleaning shag carpets, it may not be the right model for you if it’s too large to store in your home. I recommend deciding on where you will store your vacuum before you make a purchase. This way, you’ll know exactly what size you need to fit in your closet, attic, or basement. Last but not least you are going to want a vacuum with large wheels. Shag carpet is long and thick, so you’ll want to make sure the wheels can maneuver around your floors. Double check the wheel measurements on your vacuum before you make a purchase. We’ve tested tons of vacuum models and determined our five best vacuums for cleaning your shag carpets. Each of these vacuums includes features made specifically to get shag carpet clean. Keep reading to learn about each of these vacuums and decide which model may be the right one for you. The Electrolux Ultra Flex Vacuum is a corded, canister vacuum model. This vacuum is designed to perform well on shag carpets. This vacuums FlexPro Performance System includes an on/off brushroll switch and 3-level height adjustment so that you can clean any surface. Even though this vacuum is excellent for shag carpet, it will also work well on hard-surface floors. This vacuum includes a HEPA filter that will pick up over 99% of allergens and debris, so its excellent for allergy sufferers. The design of the vacuum is slim, making it easy to store. The vacuum is bagless and contains a dust cup that is easy to remove and empty. This vacuum will easily twist around the furniture in your home. The Electrolux UltraFlex Canister Vacuum includes several features that are specific for cleaning shag carpets. This vacuum includes a 21-foot cord and an 8-foot hose. You should be able to clean any room from top to bottom without unplugging the vacuum. It is also easy to use on stairs. The Miele Complete C3 for Soft Carpet provides amazing cleaning power for almost any surface. The vacuum includes adjustable suction control, which can be turned on or off using a convenient foot pedal located directly on the canister. This vacuum is a sturdy option and weighs in at 20 pounds. Make sure you’re prepared for a heavier model if you select this vacuum. This vacuum is an excellent choice for allergies sufferers. It includes a HEPA AirClean Filter as well as an AirClean Sealed system that retains almost 100% of particles that might otherwise float into the air. The Miele Complete C3 also comes with three extra accessories. These accessories include a crevice nozzle, dusting brush, and an upholstery tool. Of course, the Miele Complete C3 for Soft Carpet is excellent for cleaning shag carpet. This is an excellently engineered vacuum that far outperforms other soft carpet models. The Miele Complete C3 cleans hard-surfaced floors just as effectively as shag carpet. It also has marked settings when you’re ready to switch to “soft carpet” and clean your shag floors. The Kenmore Elite Pet-Friendly Ultra Plush is a unique vacuum because it is highly effective at cleaning shag carpet but can still pick up pet hair. It has been designed to easily clean extra plush carpets. Like other models on this list, this vacuum includes the HEPA filtration system that is a necessity for allergy sufferers. This vacuum uses Canister HEMPA bags which are easy to replace. If you have a pet, then this may be your perfect vacuum. It includes a PetPowerMate attachment that will pick up even the hardest-to-reach pet hair. Additionally, the vacuum’s double-wall design keeps the air running steadily through the vacuum. This helps the debris go straight to the bag and keeps it from getting caught in the filter. We wouldn’t recommend this vacuum unless it worked excellently on shag carpets. If you have stairs in your home, you can use this vacuum’s Stair Grip which allows the vacuum to rest on the stairs. This is a long-lasting vacuum with an easy-to-use hose that will pick up debris of any size. Check this vacuum out here. The Hoover T-Series WindTunnel Pet Rewind is another option for those with shag carpet who also own pets. This vacuum weighs just under 18 pounds. It includes a Folding Handle that makes it incredibly easy to store anywhere in your home. One of the best features of this vacuum is the retractable 25-foot cord. No more walking around to pick up your vacuum cord. If you have a pet, then you can use this vacuum’s Air-Powered Pet Hand Tool which will help you easily clean pet hair from the floor. The Pet Upholstery Tool is great for removing pet hair from your upholstered furniture. It also has a 12-inch extension wand that’s excellent for cleaning pet hair from the hard-to-reach areas of your home. 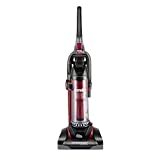 The Hoover T-Series WindTunnel Pet Rewind is an affordable option for those who need a multi-purpose vacuum. This Eureka vacuum features AirSpeed technology which helps move more air and remove extra dirt for the deepest clean possible. 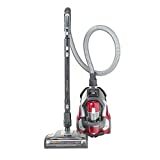 This vacuum includes an 8-Foot Deluxe Stretch Hose, so you can easily clean your walls and ceilings. The hose will allow you to clean pet hair from your home’s corners and crevices. If you have pets, you can use the vacuum’s Pet Power Paw Turbo Nozzle. The nozzle will help you clean pet hair from upholstered furniture. The Washable Dust Cup Filter is environmentally friendly and easy to remove from the vacuum machine. This vacuum is great for those who have allergies, and can efficiently clean any stairs in your home. This vacuum comes with a variety of tools to help you keep your home clean. You can see the vacuum at work in this video. The Eureka AirSpeed EXACT is another excellent option for those who have shag carpets and pets in their home. How Often Should I Vacuum My Shag Carpet? We recommend that you vacuum your shag carpet at least twice a week. Make sure you are vacuuming your carpet with a suction-only vacuum, and avoid any vacuums that include a beater bar. If you vacuum twice a week with the right machine, your shag carpet will stay clean! What If My Shag Carpet Is Dry Clean Only? If your shag carpet is dry clean only, then you can still vacuum it twice a week. When you are ready to do a deeper clean, take the rug into a dry cleaning facility. Do not attempt to clean a dry-clean-only shag rug at home. What Are Some Other Tips for Maintaining the Quality of My Shag Carpet? To keep your shag rug as clean as possible, take it outside and shake it out at least once a week. Doing so will help loosen up and eliminate stubborn dirt. Leaving the rug out in the sun will also help kill bacteria. We also recommend that you flip your shag rug over and vacuum the underside. Doing this once a month will help keep the rug thoroughly clean. This guide is designed to help you find a great vacuum cleaner for shag carpet, if you still are not sure on which option is best for you, or have a question, let me know in the comment section.